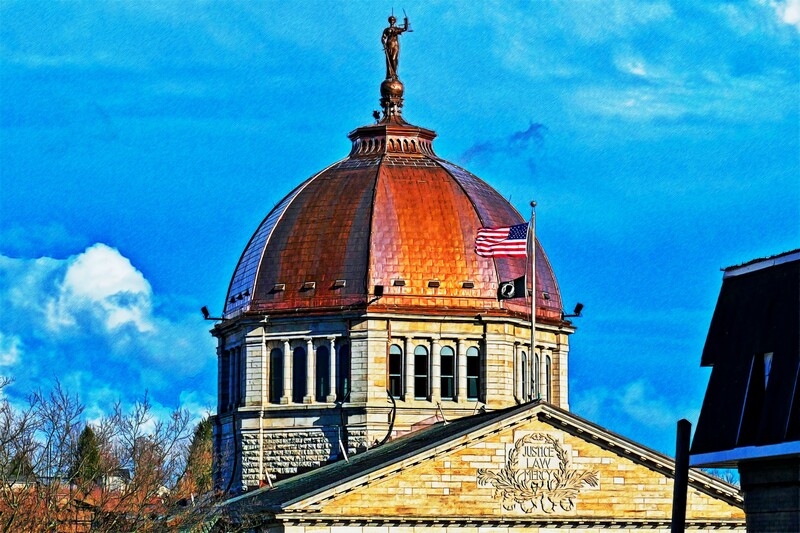 Bradford County Courthouse - Evans Roofing Company, Inc.Evans Roofing Company, Inc.
Specifier: Levine & Company, Inc.
Project Info: Complicated historical restoration of the 120 year old dome and lower roof areas. 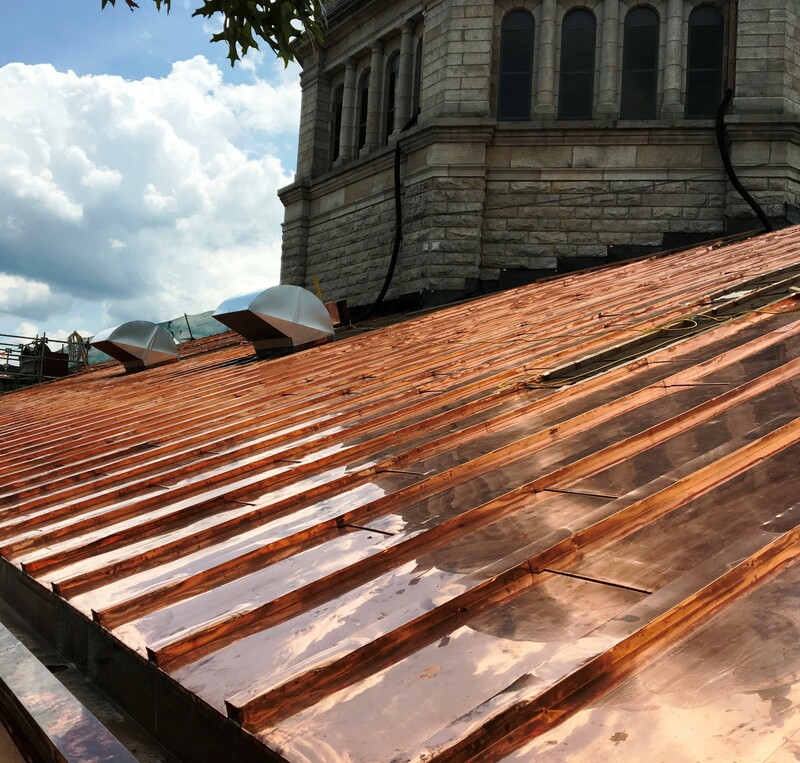 Roof System: Revere Copper Products, Inc.
An impressive 3,300 square feet of new soldered flat seam, 20 ounce, cold rolled Revere Copper pans were installed on the dome. 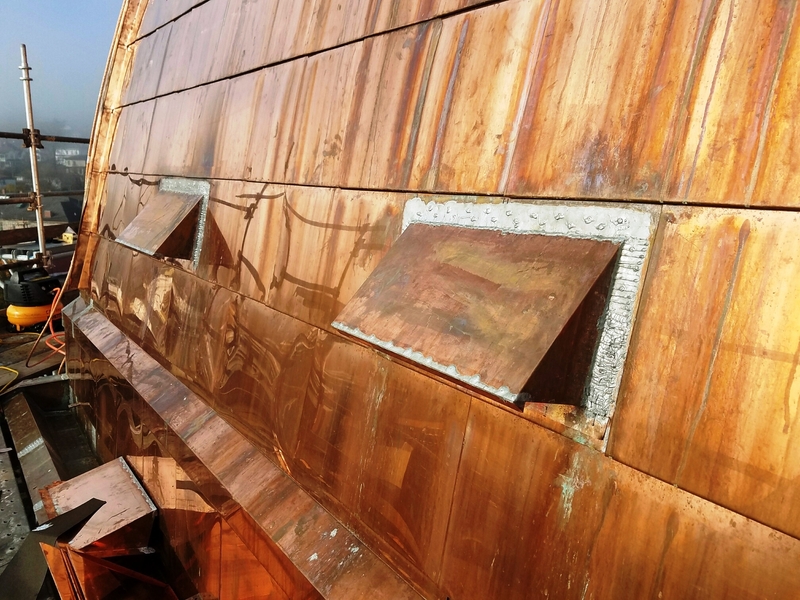 One major challenge with the new copper system was the installation of the raised copper hip battens on the dome, due to the angle, verification of field measurements and total number of hips that were required. 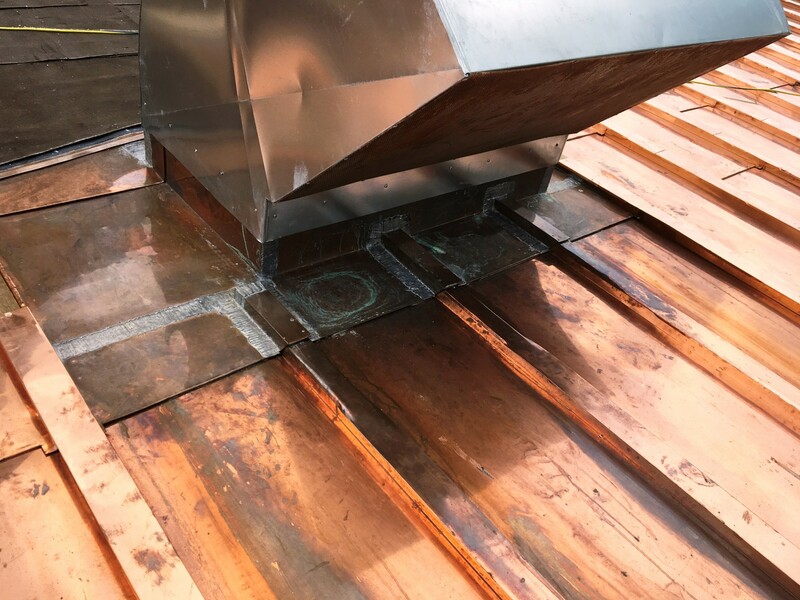 Copper fabrication of attic ventilation pieces required to blend into the existing structure. 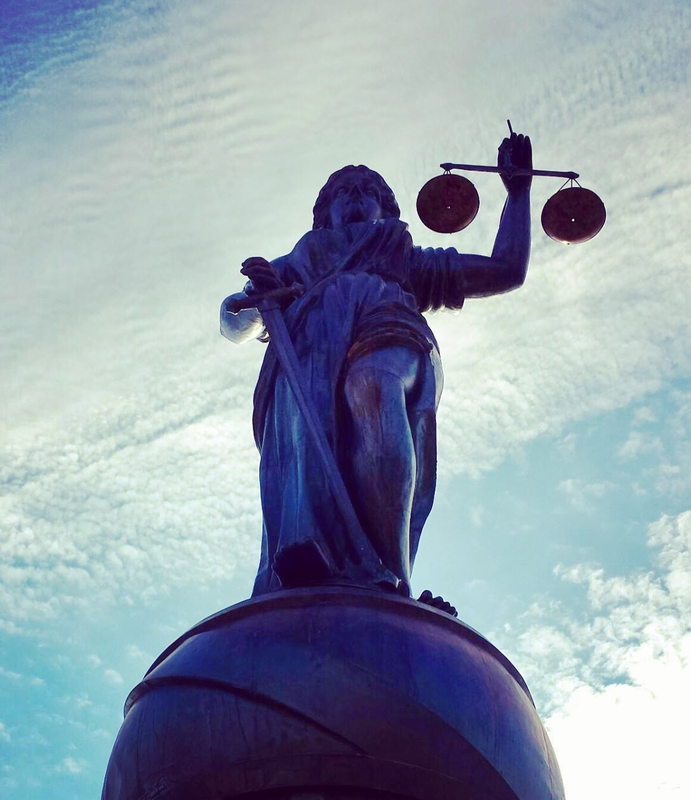 Intricate repair work to the statue of Lady Justice at the dome’s peak was needed to increase structural integrity of the statue due to weak spots and degrading copper created by over a century of exposure to the elements. 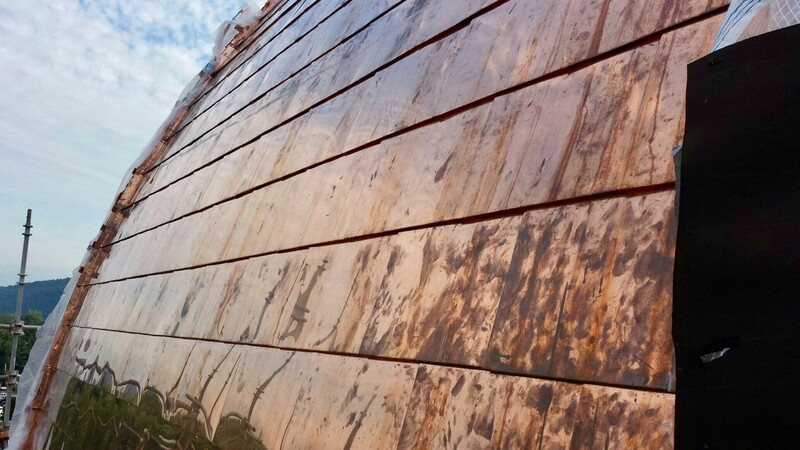 As with any historical restoration, challenges arise and with this project they seemed to be looming from the start. The interior of the dome contains an ornate and delicate mural (which had recently undergone a complete restoration) in need of protection from the project. Removing the old roof system and installation of the new system required a delicate touch in order to keep the interior from being destroyed. 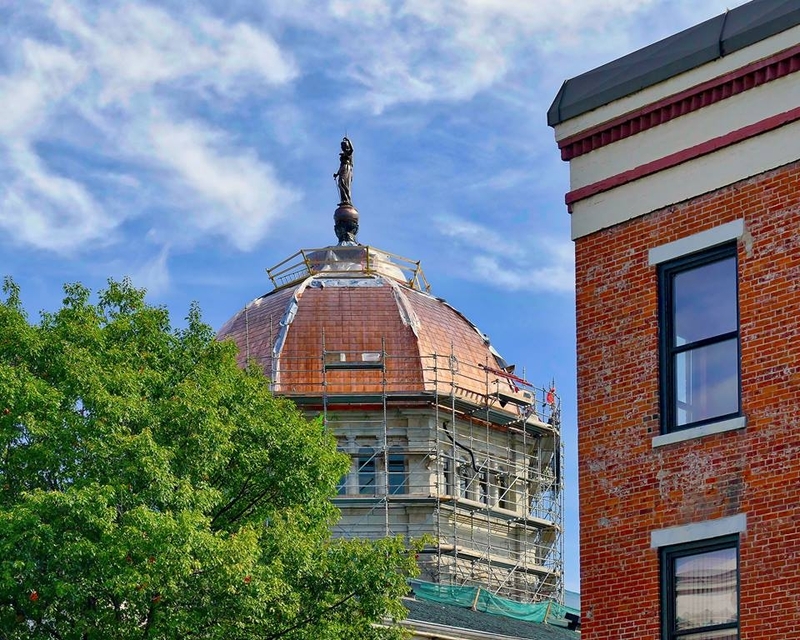 Scaffolding was used but had to be specifically engineered in order to protect the structural integrity of the building for the additional weight and the wind associated with the dome’s elevation. The lower roof areas consisted of the same terracotta tiles that needed to be removed. Underlayment also needed to be repaired before the new 12,000 sq.ft. 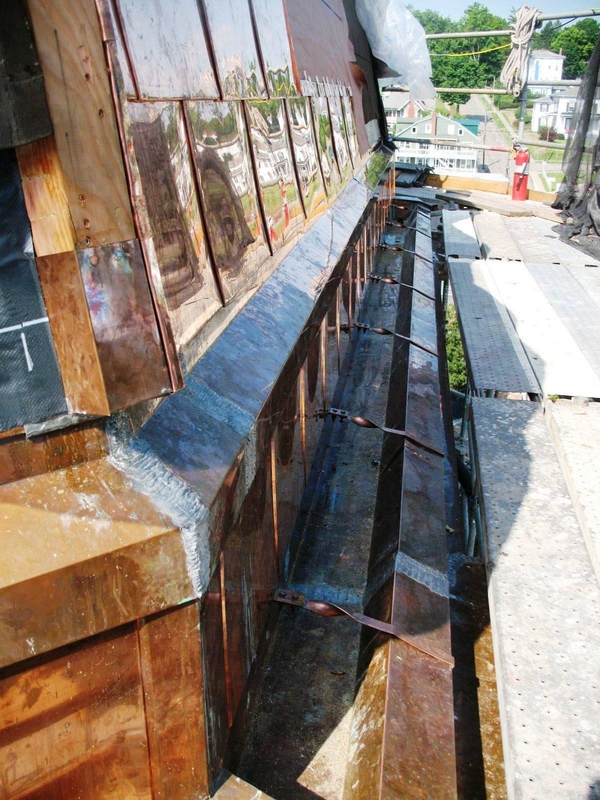 of batten seam copper roof could be installed. Installation also included permanent fall protection anchors and snowguards. 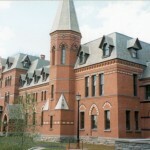 The Bradford County Courthouse was a very unique and challenging project in regards to safety. 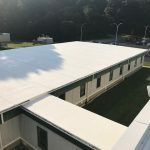 The unique challenge was well suited for the Charles F. Evans Company, Inc. as the only OSHA VPP Mobile Workforce STAR roofing contractor in the United States. The courthouse project required 100% fall protection at all times in order to keep our associates safe throughout this project. In order to achieve this, several fall protection options were selected. The associates accessed the lower sloped roof by scaffolding stair tower. Once at the eave edge, a walkway with warning lines was erected directing all associates to the fixed scaffolding ladder. 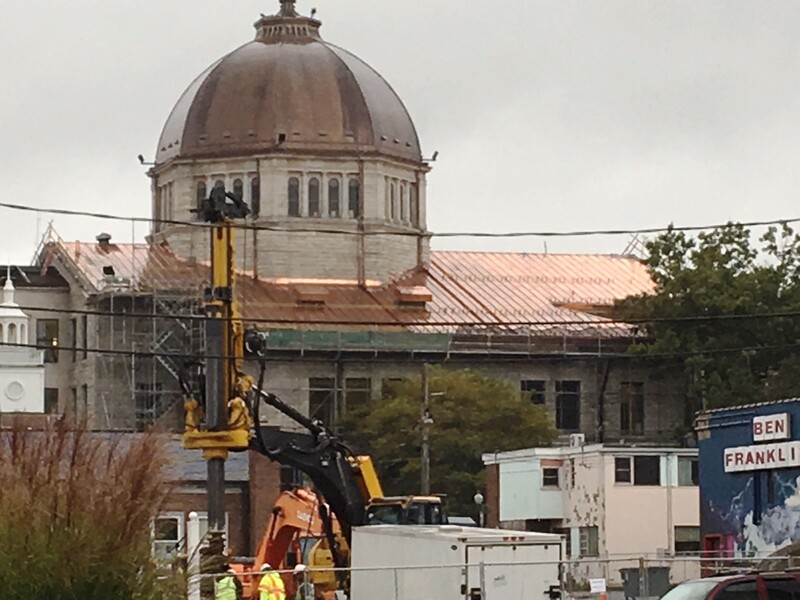 At that point, they would then access the additional scaffolding that had been erected around the base of the dome. This made for quite a challenge in order to access their work areas. 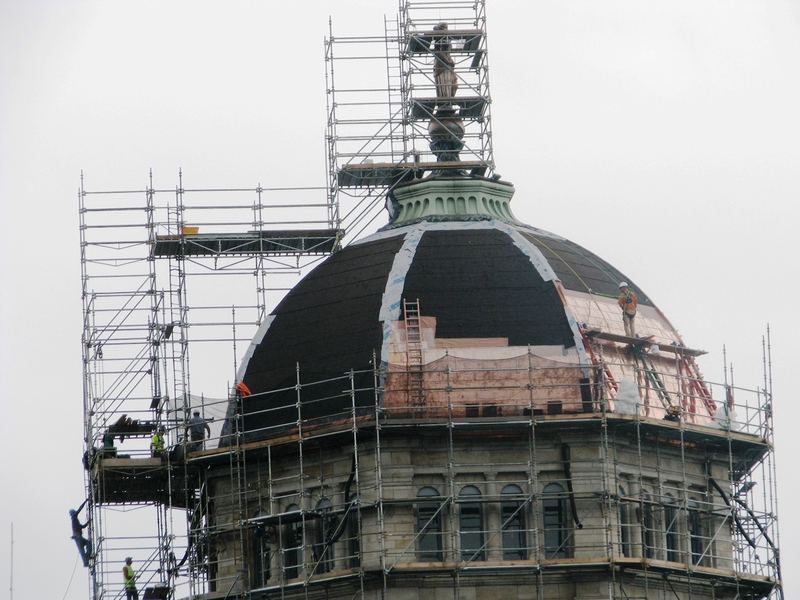 While working from the fully guard-railed scaffolding around the dome, the associates were able to remove the old existing tile around the bottom of the dome while working their way up installing the new copper flat seam panels. Moreover, extension ladders were used to access the removal and installation. While the associates were working from extension ladders, they were tied off 100% of the time using (SRL’s) with beam straps anchored to structural steel “Carnegie steel” to be exact. When the crew accessed the “shoulder area” they were then able to setup roof jacks and planks to better assist in the work. 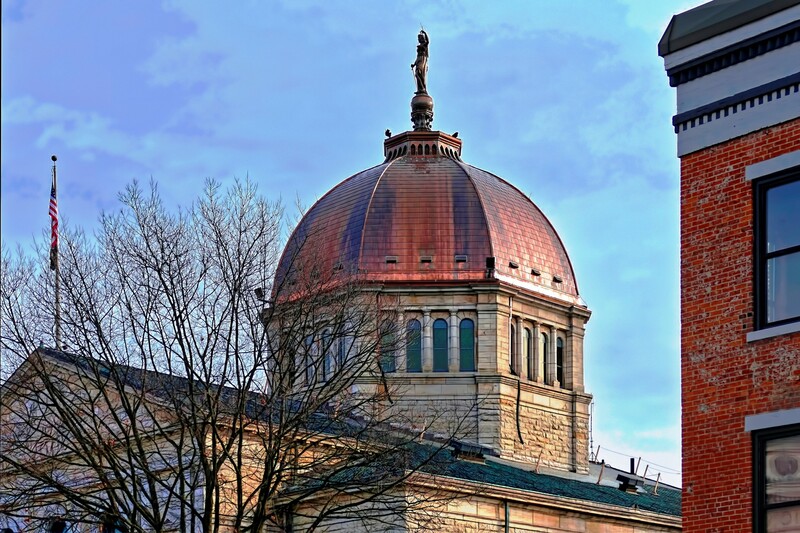 A scaffolding bridge/walkway was erected to allow access to the base of the statue and tiered upwards to the top. 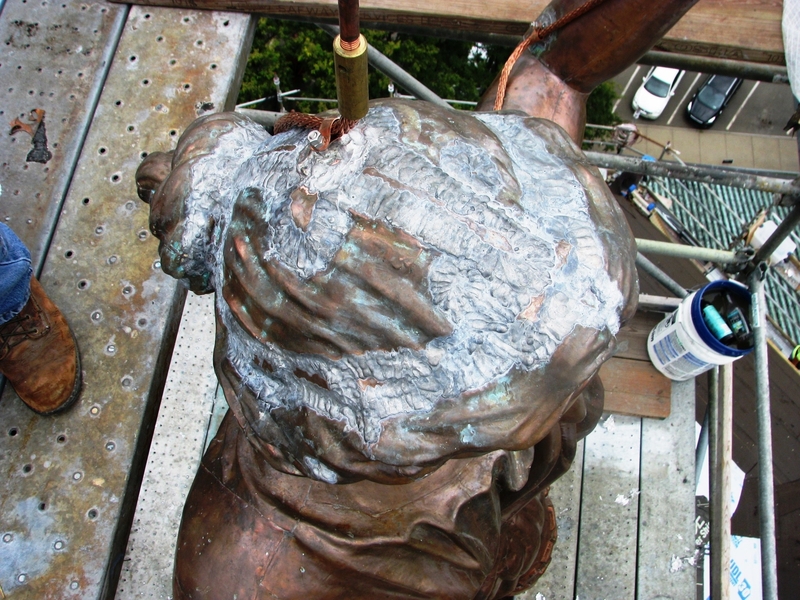 For any necessary work that was needed outside of the scaffolding system, anchor points were installed around the base and associates remained tie off using self- retracting lifelines (SRL’s). Full scaffolding system enclosed the entire project for the duration of the project. 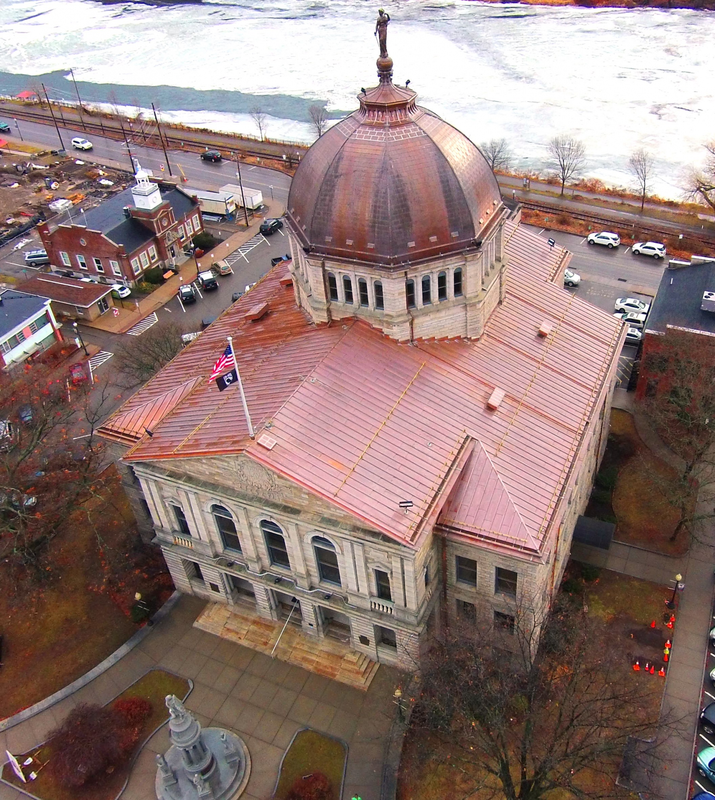 The protection of pedestrians and vehicles on the ground was also paramount as the courthouse was fully functioning for the duration of the project. 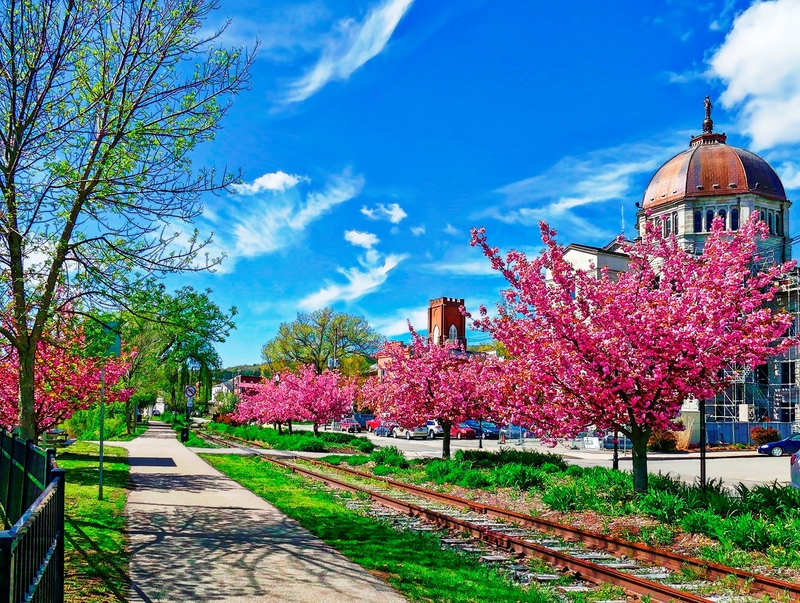 This meant a lot of ground traffic including two, one-way streets around the complex with heavy vehicle and pedestrian traffic and courthouse employee parking.